The crisis of the global capitalist-imperialist system fuels and is fueled by the contradictions of the imperialist powers at all levels. All around the world workers and peoples are facing the most ferocious attack of the system's forces which seek a solution in an ever greater and more profound barbarism. In our countries the working class and the peoples live in the conditions of fierce exploitation, unemployment, and impoverishment. The working force is getting discredited, the social and democratic rights of the masses are being trampled upon. In the meantime, the imperialist grip is tightening in a region which constitutes an ardent and crucial arena of the global imperialist competition. A region in which American, Russian, Chinese, and European imperialists come across and clash according to the ambitions and magnitudes of each, in a tangle of contradictions, that daily magnifies the dangers for the peoples. In this context the peril of war that threatens the peoples on the both sides of the Aegean Sea grows ever larger. A peril that is rooted in the particular and specific features, and in the history of the two countries' reactionary confrontation, but at the same time constitutes an integral part of the turmoil and of the developments that are occurring across the region. The first most, main, and determinative factor of these developments is the politics and ambitions of the USA. Trump's administration, which navigates with the goal of restricting the reinforcement of Russian imperialism's presence and of repelling it from the Balkans, the Middle East, and the Eastern Mediterranean, is undertaking a series of aggressive and extortionist steps. Steps that aim at the declared USA's strategic goal of world dominance, which calls for the enfeeblement and neutralization of the only power that can prove competitive at a strategic (nuclear) level: Russia. Steps which target to extort/drag their European allies/competitors in favor of the American ambitions. Steps which intend to block the endeavors of Chinese imperialism in the region and in Europe. Steps that kindle tensions and contradictions between regional and local powers in the greater region, the wounds of which are open and the bloody confrontations of the past and the present imperialist interventions are ongoing. It is in this context that the reactionary rivalry of the Greek and Turkish bourgeois classes is being rekindled and aggravated. 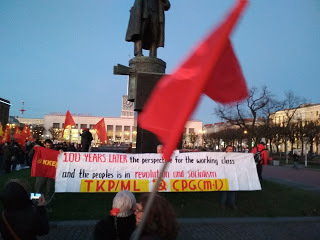 The two bourgeois classes are dependent upon American imperialism, which for decades now uses both countries as a geostrategic bulwark against the former Soviet Union and Russia, as a platform for its campaigns to the Balkans, the Black Sea, Caucasus, Middle East and Eastern Mediterranean, or even as an extortion instrument against the EU imperialists. Two bourgeois classes which haven't ceased to manifest their competition and to claim favorable roles from their transatlantic patron. A competition that has to do not only with the fact of which one will be favored over the other regarding roles and missions in the region. It also concerns matters of sovereignty for each of them from Thrace and the Aegean Sea to Cyprus, where both parties have contributed to its division. Neither of the competitors has ever aimed at a peaceful settlement of the existing matters, but at the "prevalence" of one over the other, with ceaseless nationalist sermons from both sides. In such a competition, which constantly reproduced and intensified the imperialist dominance and fueled the arms race, the two bourgeois classes have attempted to drag both our peoples behind their reactionary ambitions. Whether brandishing actual facts of this competition (such as the political-military defeat of the Greek side in 1974), or highlighting the new objectives, new "capabilities" of their reactionary ambitions. Under the current conditions each bourgeois class has accumulated a heavy burden of cul-de-sac and opportunistic ambitions. The Turkish side has perceived the bloodshed in the M. East, the vacillations of USA regarding the relations they will have with and the roles they will assign to the new powers (Iran, Israel, Saudi Arabia...), as an "opportunity" to promote Turkey as a dominant peripheral power, as a solution to its great socio-economic problems and its "on-paper" development, until the "decisive moment" when it will crush the just struggle of the Kurdish people. Therefore, on the one hand, the Turkish fascist regime, enshrouded in a parliamentary cloak, heightens its reactionary assault against the peoples and the masses of Turkey and campaigns in Afrin, while at the same time it intensifies its confrontation with the Greek side and openly manifests -by the means of FYROM matter (ie Former Yugoslav Republic of Macedonia – ed)- its aspirations for its presence and role in the Balkans. However, the Turkish regime certainly cannot be considered all-mighty. The contradiction of the popular-working masses is extremely acute, as it became clear the previous years (Taksim), and today, with the thousands of imprisoned and persecuted. And as the coup of June 2016 has demonstrated, the balances of the regime are unsteady, while the American extortions are fueling the instability and contradictions in its interior. Besides, the "European solution", that Erdogan sought, has been blocked by the American and European imperialists, while steps towards Russia merely demonstrate the regime's efforts to negotiate the terms of its dependency from the USA. Also, now with the conquest of Afrin, the Turkish regime is burdened with a success not easily manageable military and politically in anticipation of the developments that will follow in the region. A success that might generate new pressures and produce new opportunism. Accordingly, the Greek bourgeoisie attempts to find a way out of the compression of its credit margins and ambitions, that it has suffered during the last years in the clamping jaws of the USA-EU contradictions, undertaking "geostrategical" roles of servitude of its US/NATO bosses. It also believes that it has an opportunity to transform the balance of powers with its main competitor: Turkey, which at the moment is intertwined in a tangle of contradictions and problems, and having the advantage, as the Greek bourgeoisie believes, of upgrading its use by the USA as opposed to Russia. This is why it rushes in the Balkans to serve the multi-level US interference-intervention aimed at the geopolitical, energy, and military exclusion of Russia from the peninsula. That is why, on the pretext of the refugee problem, and with the real objective of controlling the Russian descent in the Mediterranean, it was decided “overnight” to install NATO in the Aegean. That is why the alliance "axes" have been established for years with Israel and Egypt, and recently also with Saudi Arabia. Axes that the US promoted to extort Turkey's compliance with their demands and have been recently upgraded, with the Greek government looking forward to ensuring the support of these forces against Turkey, even in the event of a violent episode. Overall, the SYRIZA-ANEL government, with the upgrading of the US military and political dominance over the country and with all its political and diplomatic moves in the region, has turned Greece hostile to the peoples of the region, in servitude of the US/NATO military plans. A special role in its anti-historical and dangerous for its peoples’ aspirations, is reserved for the EEZ (Exclusive Economic Zones), through the proclamation of which the Greek side aims to "exclude" Turkey, and even to extend its own dominance over the Ionian (in confrontation with Albania) and of course over the Aegean Sea up to the South Mediterranean. However, the EEZs constitute in instrument in the hands of the imperialists so that their multinational companies can pillage energy resources of the region. But, above all, in order to form alliances with the local forces to support their own ambitions (such as the US with the so-called axes of Greece) as well as to acquire decisive capacities in matters of sovereignty of the countries of the region. Cyprus is also being pulled into the swirl of these developments, whose people, Greek and Turkish Cypriots, lives under the conditions of occupation and partitioning, under the imposition and involvement of British, American, European, and Russian imperialism, and under the ever-intensifying intent of Western imperialists for it to become a protectorate/unsinkable aircraft carrier of their war plans. A goal that on the one hand employs the Turkish occupation and on the other uses Greek ambitions to accept leading roles in the region, in order to impose new “Annan plans” (a UN-sponsored plan for the reunification of Cyprus as two federal states with a single federal government -ed) on the much-suffered island and to construct the southern energy pipelines that will complement the blockage of Russian energy to Europe. This is the reactionary context in which all the tension episodes of the recent period have taken place in the Aegean Sea, in the Cyprus area, and on the borders of the Evros river. It is in this context, which is constantly fueled by the aggressive moves of American imperialism throughout the region, but also heated by the subjugated and unraveled bourgeois classes of the two countries and their nationalistic exclamations, that the peril of an unjust war intensifies. A peril which is already being used to the detriment of the rights and the struggle of the workers and the popular masses of the two countries. A war that in the given circumstances can cause a wider outbreak throughout the region from the Mediterranean to the Balkans! Our peoples have nothing to divide! The path of following the bourgeois class of each country will lead to an obvious deadend and a danger to their interests. Whether it is in this or another conjuncture that the US/NATO projects and interests favor the pursuits of one or another ruling class does not concern the interests of the masses. In any development, when our peoples are followers of the bourgeoisie and submissive to imperialism, it is they who will pay even with their own blood the imperialist and reactionary war plans. Our peoples must join their struggle for their common future! Because there are no nationalist ideas of "lost empires" and "historical territories” in the hearts of our peoples. In the hearts of our peoples dwells the desire for bread - work - peace - independence! The vision of our peoples may be the revolutionary socialist prospect and their pursuit of peace, friendship, and solidarity with all peoples of the region. That is why today it is necessary and imperative to struggle for a broad and massive anti-war movement on both sides of the Aegean Sea. It is the only thing that can block the imperialist plans and open the way for the confrontation with the real enemies of our peoples. No to nationalism and fascism! Stop the arms race! Do not let the sweat and the rights of the masses become the weapons of their slaughter! Down with the policy of imperialist dependence Common struggle of our peoples for peace and independence!